Gresham unwraps each tale like the petals of a lotus flower. At the end of the evening you leave with something beautiful created in your own mind. Be transported to the passion-filled world of heroic adventure and romance within a masterpiece of world literature. Dive into the majestic mythology of Persia – where supersized heroes and magical horses challenge the selfish demands of kings; where fathers and sons meet as strangers on the battlefield and, condemned by a femme fatale queen, a lion-hearted young man journeys through fire. 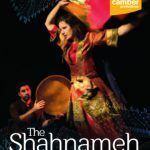 Experience the energy and humour of this sweeping legendary history of Iran from tales of the deeply loved, yet reluctant hero, Rustam, to fantastical creatures like the mighty Simorgh and its miraculous feathers. The Shahnameh was written by the Iranian poet, Ferdowsi over 1,000 years ago and stretches from the beginning of time to the 7th century fall of the Persian Empire. 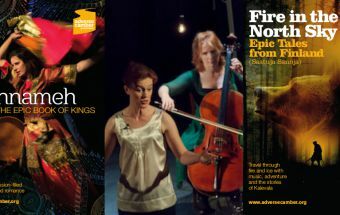 Here, a hand-picked selection of stories are brought to life by dazzling performance storyteller, Xanthe Gresham Knight and the sublime, rhythmic sounds of virtuoso Kurdish Iranian musician, Arash Moradi, on daf, setar and shurangiz (the “excitement maker”). The Shahnameh touches on concerns that continue to plague and intrigue us today such as the meaning of truth, integrity and loyalty; with stories that move from the otherworldly, to the most basic human dramas and desires. 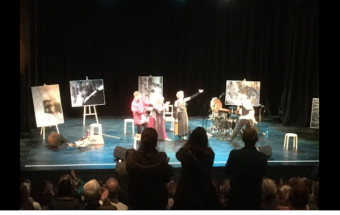 Enjoy these ancient and treasured stories wrapped up in an intimate, enchanting and powerful performance. Listen to this great In Our Time broadcast about Ferdowsi. "Gresham sews everything together with passion, intensity, shards of humour and the economy of performance that marks out storytelling while vigorously exploring the themes of immigration, displacement, tyranny and the struggle for freedom." "Drama, emotion and humour all rolled into one."